Millennials may have only a little saved for retirement, but they still want to retire early. A recent Bankrate.com survey asked millennials, classified as Americans ages 18 to 37, what the perfect time to retire would be. Their answer: 61 years old. “Early retirement is something that seems very appealing,” Bankrate.com analyst Amanda Dixon tells CNBC Make It. If only wishing made it so. 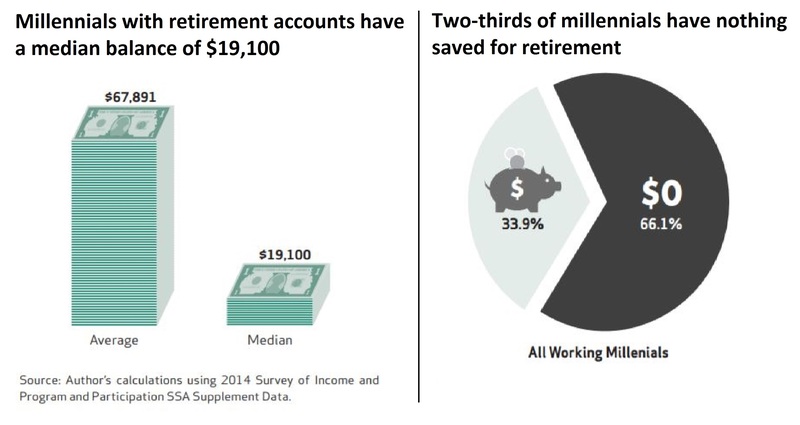 Of those millennials already saving, the median retirement account balance is about $19,100. But overall, roughly two-thirds of millennials have nothing saved so far, according to a February report by the National Institute on Retirement Security. “Unfortunately, even though 61 would be a great age to retire, it’s just not the reality for most people,” Dixons says. In fact, Nerdwallet calculates that a more realistic outcome for the graduates of the Class of 2018 is a retirement age of 72 — and that's only if they budget wisely. If you are looking to retire on the early side, experts recommend doubling down on your contribution level to a 401(k) or IRA and automating your deposits. The average millennial is contributing about 7.5 percent of their income, according to Fidelity. But that’s way below the suggested rate of 15 percent. “You have to make it something you’re doing consistently,” Dixon says, adding that retiring early does take some extra effort. And that can include doing things like tracking your spending, living in a cheaper home and even dining in more often, according to those who have achieved early retirement. That said, building these habits when you're young will have the biggest impact. Even if you're like most millennials and have student loan debt, that doesn't automatically preclude you from retiring early. “It is definitely possible to pay off your debt and save for the future at the same time,” Dixon says.